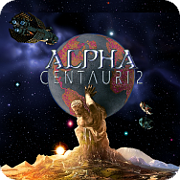 Welcome to Cult of Planet thread of AC2DG (Alpha Centauri 2 Democracy Game). If you are reading this thread, you are a Cultist of Planet! Our starting position. I will play 2101 to set up the game, and plan to post ending turn for viewing. The starting tile is river, the same. South direction looks like there is potentially more tiles to establish a base in distance of 4 tiles, so colony pod might go there. Direction to north looks like there is land, but not sure if there is connection. Mindworm is capable to scout south-east by river and then fungus. We have already Centauri Ecology. What next? B-line to crawlers? build or discover first? Played the turn, so that we have all the teams started. Mindworm showed good terrain to the south. Colony pod goes there. Scout in Dawn of Planet rushed, the 11th mineral. Research set both: Discover and Build. A bit broad, but getting Industrial Automation with Blind research is not easy. - colony pod enters the tile with river, SW.
- Mindworm scouts on fungus, SW, trying to uncover as many tiles as it can. But main objective is actually locate the best tile for the second base. A bit strange, but Cult gets the first technology, not sure why this turn. Looks weird, like we got some lab points from where? Maybe it was an event, a rare one - research breakthrough...? Proposals on the screenie above. Played 2103. I will post a screenie, but colony pod entered intended base site (was chance only), and scout did not. Mindworm caught a spore launcher. Before going to 2104, I think to post on GOG.com. This is probably one of the most active SMACX sites, and there may be someone interested in joining.